In the ye old days, it was customary for wealthy brides to receive a trousseau on her wedding. This contained all the clothes that the lady will need for her married life. Then as the years rolled on this turned into household items which the couple need to set up home. However nowadays many of us already have all the things we need therefore what should you ask your guest to give? Whether you are asking them to contribute to a specific element like the hotel or just a general pot of money this is a nice idea because it will give the guest a chance to contribute to a gift that will be enjoyed and provided many happy memories. There is nothing like spreading your joy with other people so why not help others who are in need. In these current economic time, charities are the hardest hit due to the lack of funding from governments so they need private donations more then ever. We all wish the happy couple the best for the future and what could be better then giving them a hand in getting their first house! With rising house prices (especially in the UK), it is getting harder and harder for first time buyer to build up the deposit that is necessary to secure a mortgage on a house so with the help of family and friends you could make their future a little bit easier. This is the route I took and this caused a raised eyebrow from my mother in law since asking for money as a wedding gift is often considered vulgar. 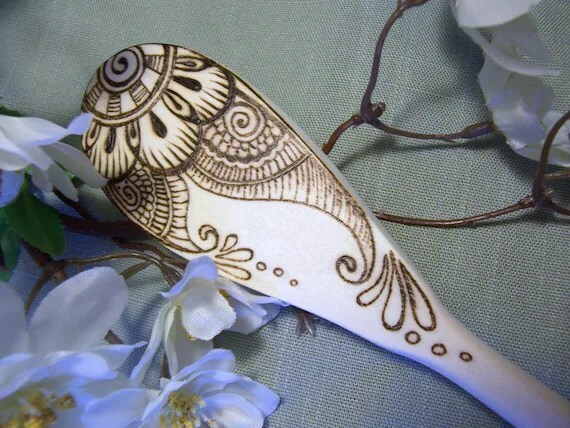 However, it is traditional in many eastern cultures for money to be presented as a wedding gifts and since I am Chinese this seemed perfectly natural to me. Now each culture has there own way of presenting the money to the couple, for the Chinese, it is presented in red envelope, just like the one above but it can also be included in the congratulation card as well. Do you have any other ideas which might be an alternative to the traditional wedding list? If you do then let us know in the comments! 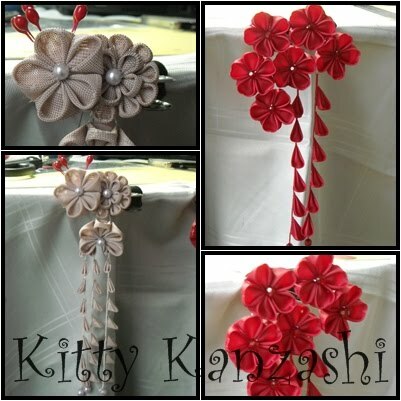 Kitty Kanzashi – Big Day! 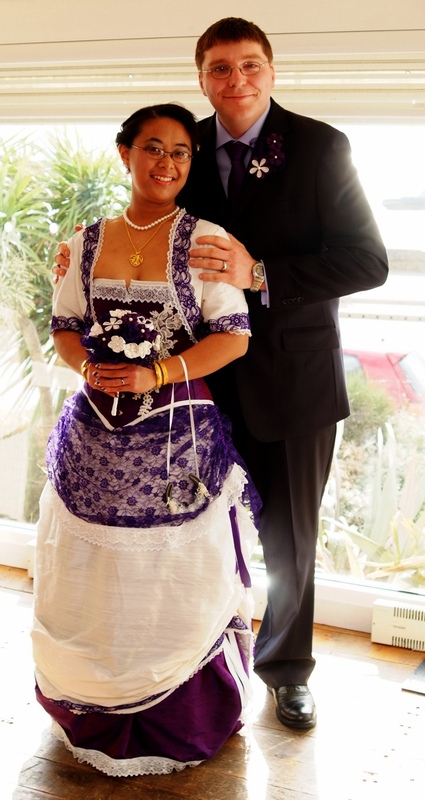 I never thought this day would happen but on the 17 of October, 2011, I, Kitty Kanzashi married my lovely partner of 11years! We both wanted an intimate wedding because neither of us enjoy being in the limelight, and we wanted to ensure that we took the time to talk to our guests and make sure they were enjoying themselves. Apart from the hectic half hour where we had to get photos of us with all our relatives, it was a lovely day. 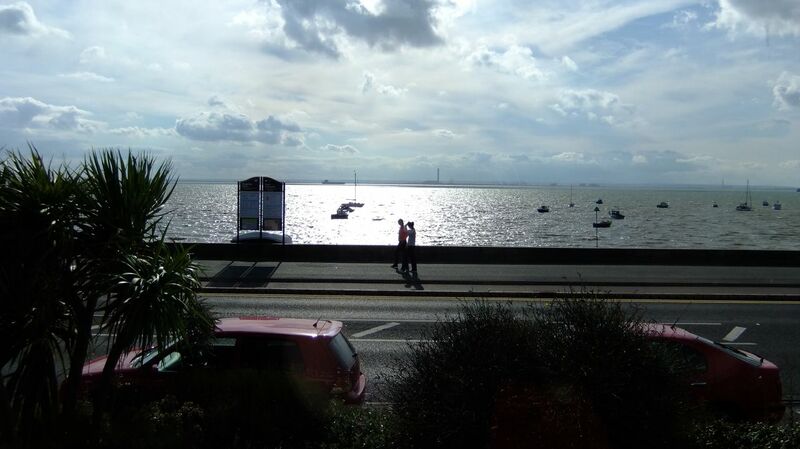 Since both our families live near Southend on Sea, what better place to get married then at a cozy seaside hotel? 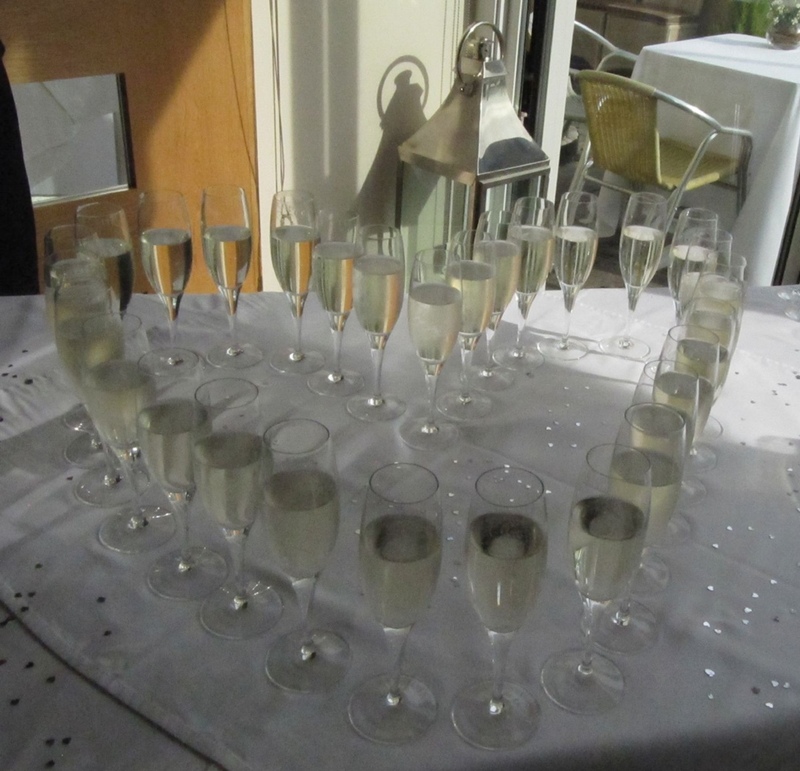 We chose to get married in the lovely Roslin Hotel right on the seafront because (1), the food there was fab and, (2), we wanted a place where we could have the ceremony and reception in the same place. My wedding dress was made by the brilliant Bound By Obsession, while my partner looked very dashing in his TM Lewin suit. 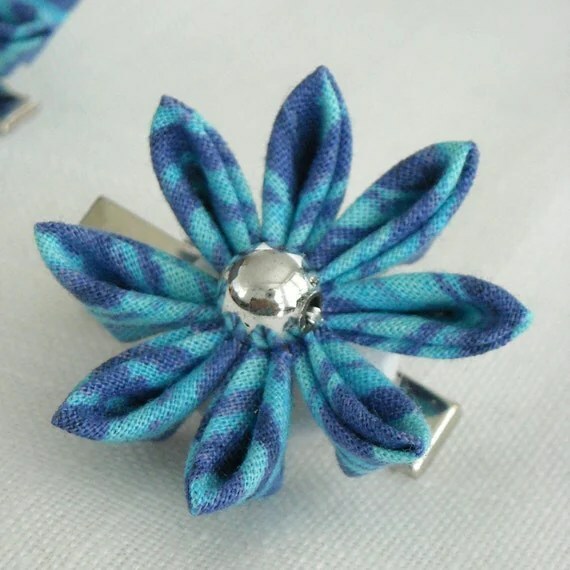 Of course, the wedding would not be complete without a few kanzashi for me, my partner, the immediate family and my matron of honour. 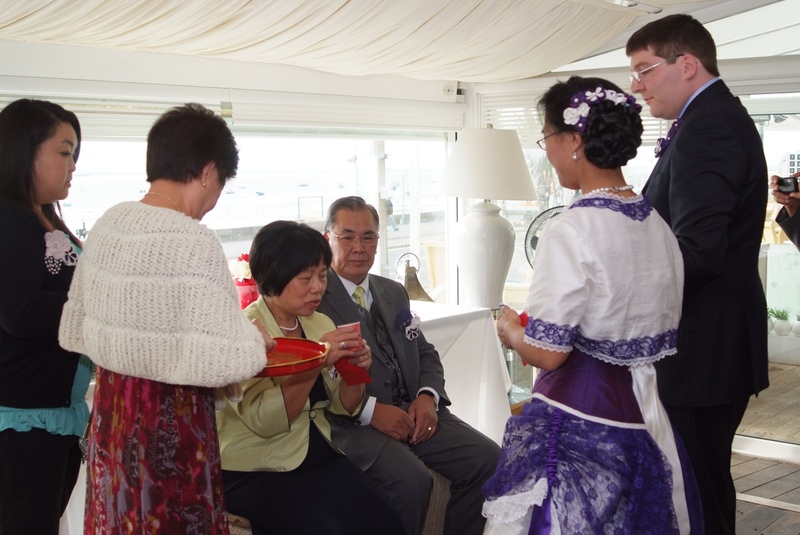 After the ceremony, I set aside some time for a tea ceremony which was an element of my Chinese culture popping in. 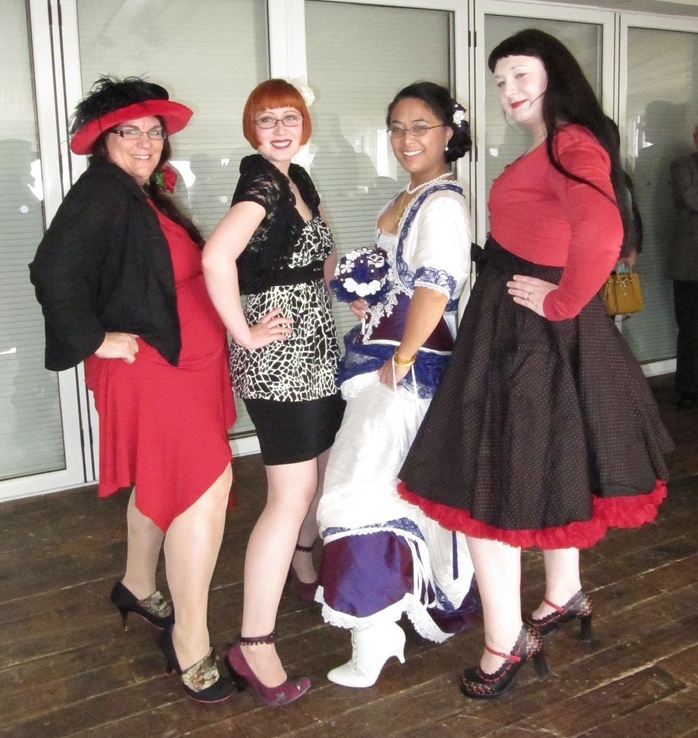 Oh, and here is a fun shot of my friends and I showing off our shoes! In the west, a traditional wedding is a white affair however in the multi-cultural world that we live in today this is no longer the only option. 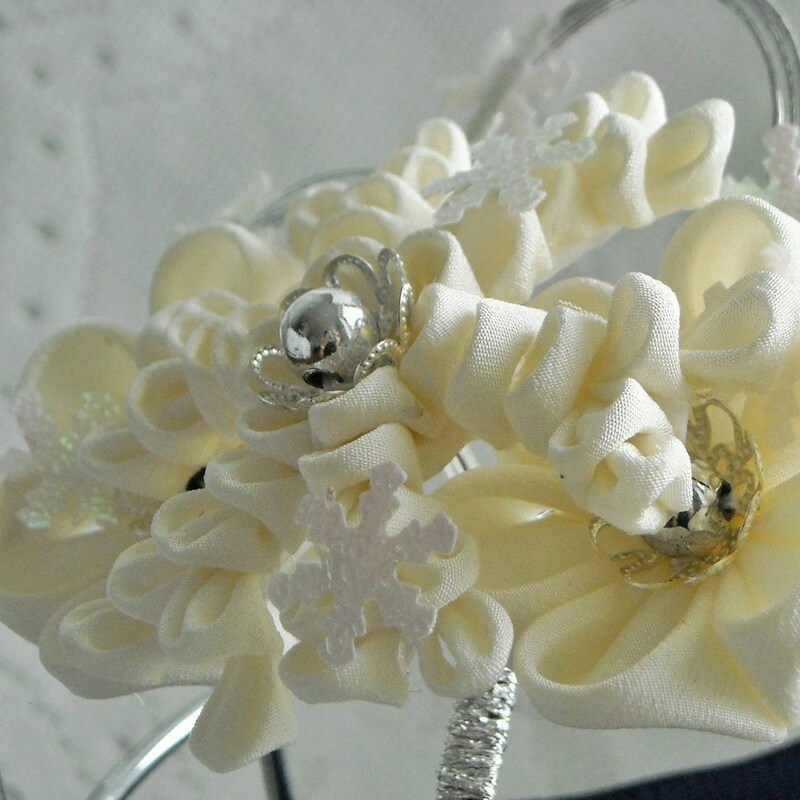 Recently I was commissioned by a bride to make two hana kanzashi because she was getting married in a kimono. 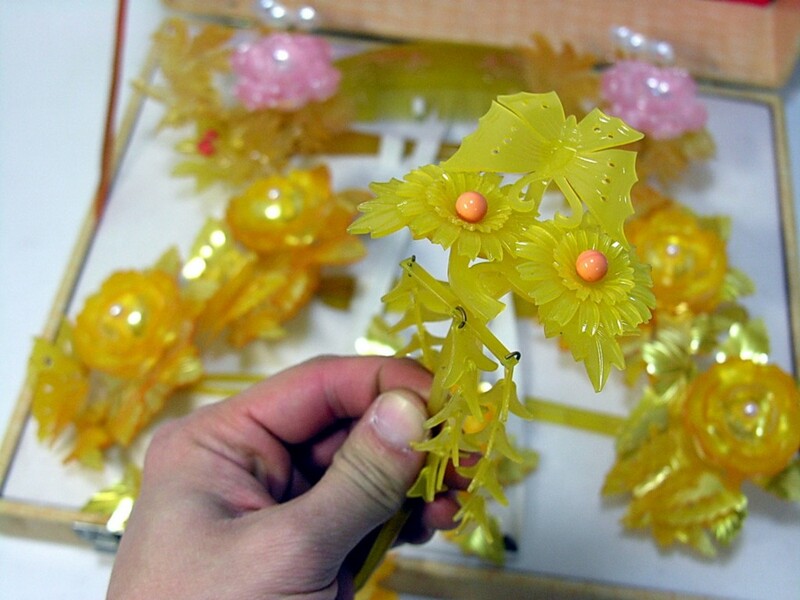 Hana kanzashi translated from Japanese to English means “flower hair ornaments” and are worn mainly by Maiko (apprentice geiko). 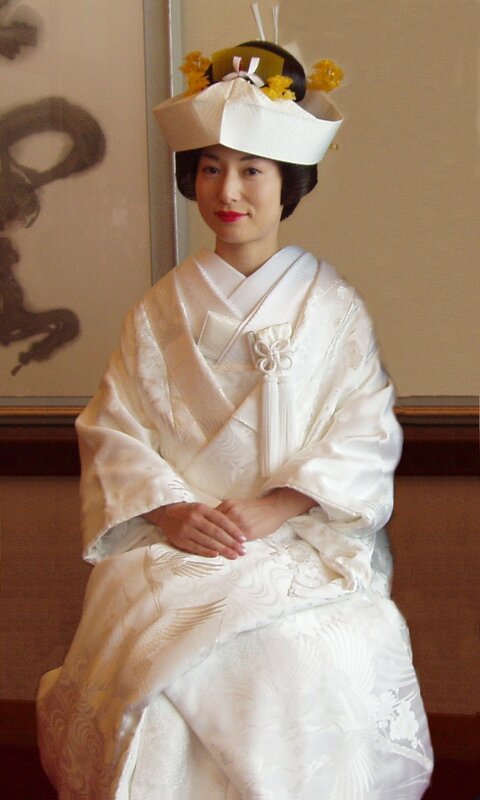 However they are also worn on special occasions such as weddings or the “coming of age” ceremony in Japan. Here is a picture of Maiko Koyoshi wearing a momiji (Maple Leaf) kanzashi. 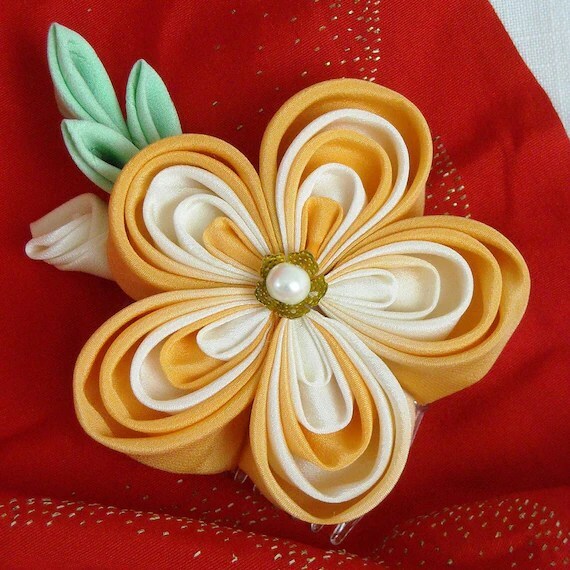 So which kanzashi did my bride commissioned me to make? In the end she choice to customize Cherry Blossom Crescent and Mellow Pink and the end result was as follow. 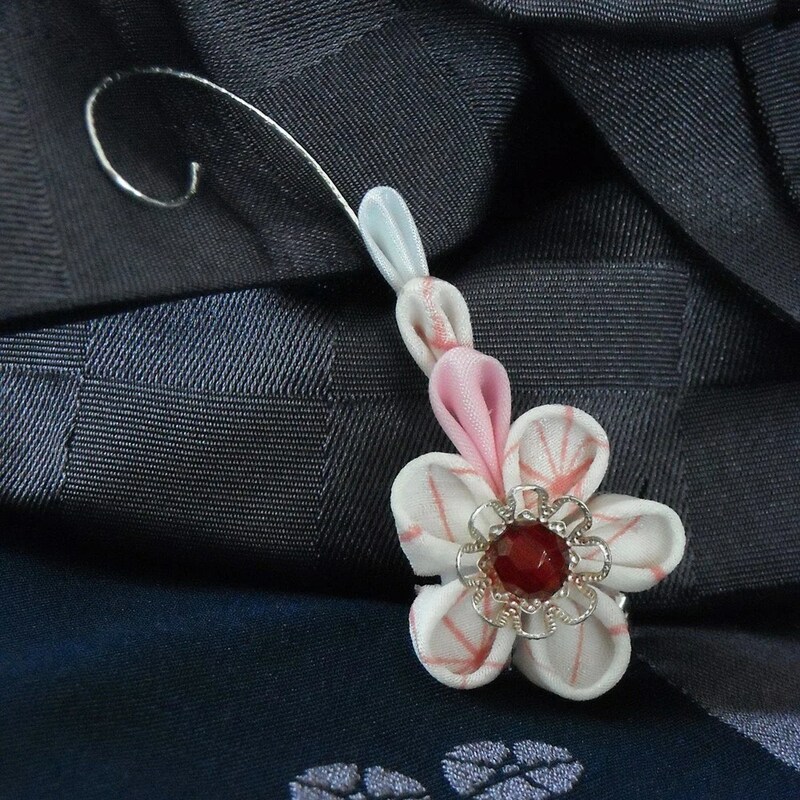 I really enjoy fulfilling custom order as it allows me to create kanzashi which I wouldn’t have otherwise made due to storage constraints. 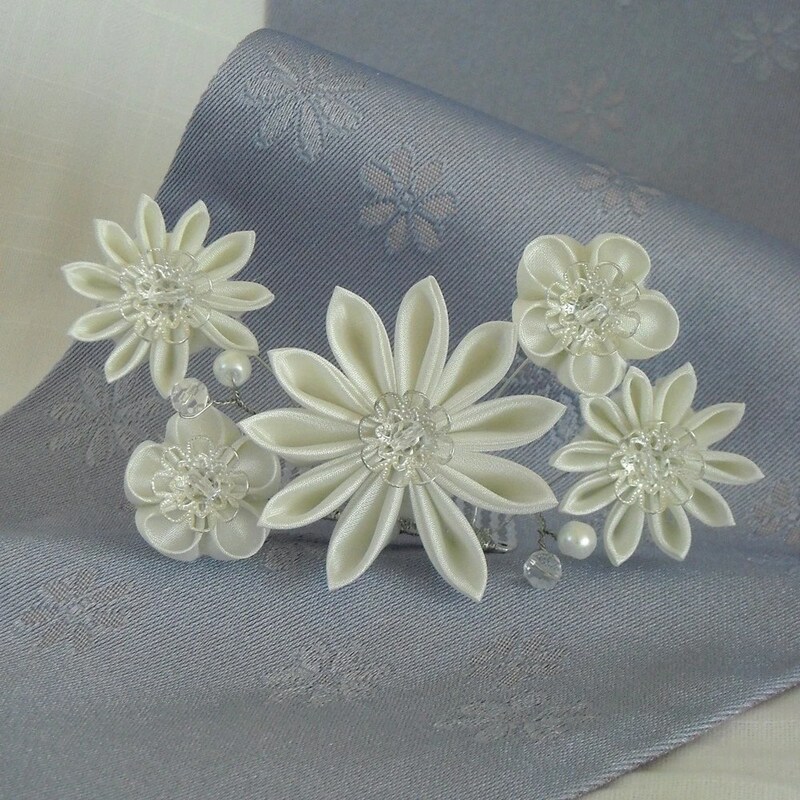 Also the thought of creating an item which the bride will treasure makes me very happy. 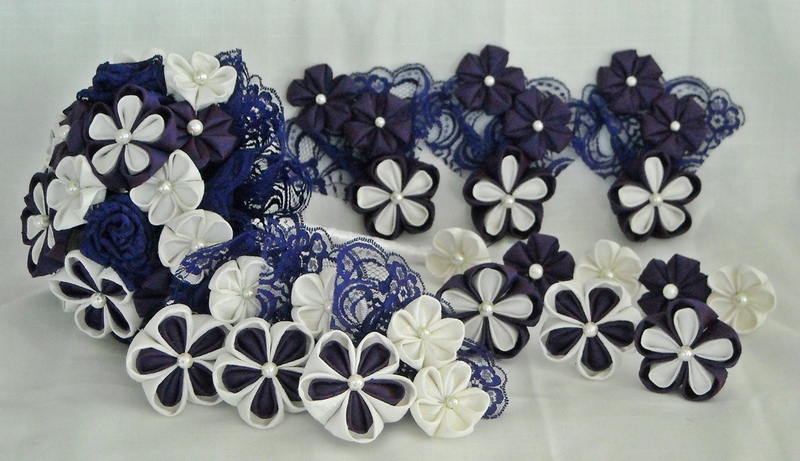 However for all you brides who are planning a white wedding do not despair since I am able to customize all of my kanzashi designs to suit your colour scheme. 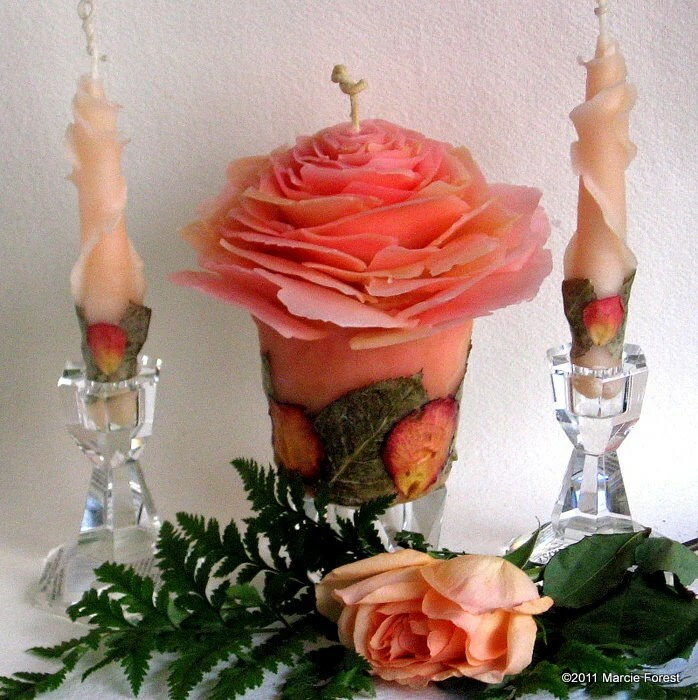 If you are interested in any of my designs then visit my shop.